We are big fans of pizza in our house. Homemade pizza is very easy to make, economical and gives you a great way to use up small amounts of leftover meat or vegetables in the refrigerator. I love to try new pizza combinations, although this is not always popular in our house. Sometimes you just want what’s familiar. 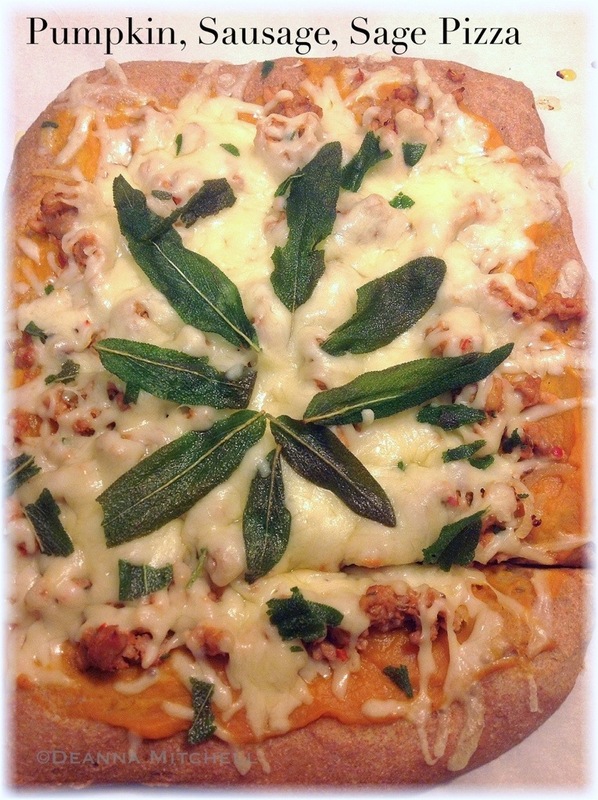 This pizza was terrific–I will definitely make it again! In full disclosure, this pizza elicited more teen jokes than any other meal I’ve prepared. Trying to be “artsy,” I made a flower design with the sage leaves. My daughter thought it looked like a marijuana leaf. I’m always glad to be the source of amusement. And really, no more trips to Spencer’s Novelty Shop. Really. This pizza is super tasty and full of fall flavor. It involves no illegal substances, although pumpkin is so addictive this time of year, it probably should require a driver’s license to purchase. We used a spicy chicken sausage, but I think an Italian sausage or sage sausage would be pretty terrific as well. Or even soyrizo if you are going meatless. I replaced our usual mozzarella with a blend of Swiss and Gruyère cheese–I think those cheeses taste great with the sage and pumpkin (and they melt beautifully). 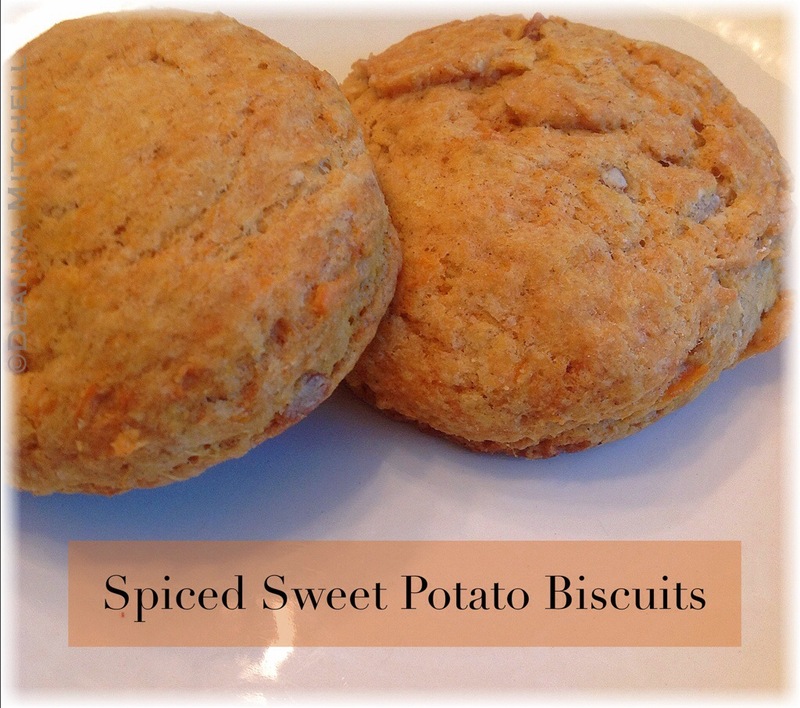 I used organic canned pumpkin for this recipe because it is already cooked and it is very thick with little residual moisture. If you use fresh pumpkin, make sure you cook it down to a very thick paste or your pizza dough will be quite soggy (I made that mistake with butternut squash once and it was not good). In a medium skillet or saute pan, heat the olive oil to medium high. When oil is hot, add the sage leaves and fry them for about 90 seconds per side or until they are crispy, but not browned. Remove sage leaves to a paper towel to drain. Add the sausage to the pan and reduce the heat to medium. Cook the sausage until no longer pink, breaking up any large clumps with the back of a wooden spoon. Remove the sausage from the pan to a colander or paper towel-lined plate to drain. Add onion and garlic to the pan with the drippings and saute for 4-5 minutes, or until the onion is soft and starts to caramelize a bit. Remove the onion and garlic to a small bowl. Assemble the pizza by stretching the dough (my pizzas are never round–more like rounded rectangles) onto a flour dusted baking sheet or pizza stone. Top the dough with the pumpkin, spreading it across the dough, leaving a 1-2″ crust around the edges. Sprinkle the onions and garlic over the pumpkin. Crumble up 2-3 sage leaves and sprinkle them over the onions. Top the onions with the crumbled and drained sausage. Cover the whole thing with cheese. Arrange the remaining sage leaves into a flower that will be completely misinterpreted by your family. Bake for 15-18 minutes or until cheese is just browned and bubbly. Cut the pizza and serve immediately. It’s fall, y’all. Time to break out the boots, cozy sweaters and the fall recipe book! This recipe includes one of my favorite fall flavor combinations–locally made bulk chorizo sausage and roasted sweet potatoes. We buy our bulk chorizo from Mae Farm, a local farm that raises pigs in the highest ethical standards, with lots of room to roam and be pigs. Their chorizo is pretty phenomenal and I can’t wait for fall so we can make this pizza again! By the way, this same combination of flavors works great in a quesadilla as well! If you are feeding people who aren’t fans of spice, you can leave out the chili in adobo sauce. This pizza is a knife and fork pizza. Or at least a two napkin pizza. It is chock full of late summer/early fall goodness, like roasted sweet potato, sweet onions, locally made chorizo sausage, and colorful, fresh bell peppers. This pizza is a meal In itself. I had originally planned to have a salad with dinner, but once I saw how huge the pizza was, I decided to save the salad for another night! Pizza is one of those incredibly versatile meals that can make the most of whatever you have in the pantry or refrigerator. I’m including my whole wheat crust recipe because it is filling and higher in protein and fiber. You could replace it with whatever crust you like, though. I’m definitely going to make this again during football season! Prepare the pizza crust and let rise. In a 12″ skillet, brown the chorizo sausage over medium heat. Place a strainer over a thick layer of paper towel and pour sausage and drippings into the strainer and set aside. Return the skillet to the heat, and add the olive oil, onion, garlic and peppers. Stir together and cook over medium heat for about 15 minutes or until all the vegetables are soft and there is no liquid in the pan. Remove pan from heat. On a lightly greased or flour dusted baking sheet, stretch dough out to make your pizza shape (I prefer square pizzas, but that’s me). 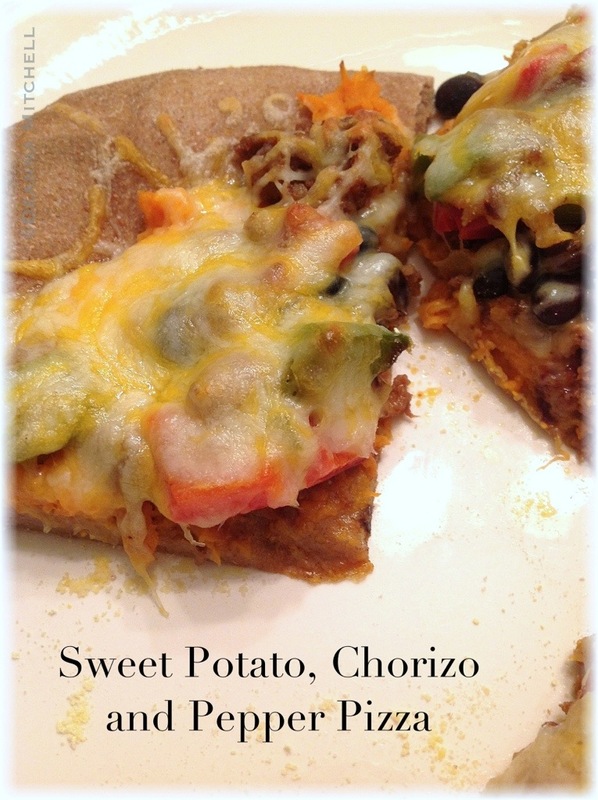 Spread the sweet potato over the crust and sprinkle the drained chorizo over the sweet potato. Add black beans on top of the sausage, then add the pepper mixture over all. Cover the vegetables with a generous amount of cheese. Bake the pizza for 15-20 minutes. Shape and make your pizzas according to the recipe directions. Use stock, never water. Homemade stock is always better than what you can buy and almost any stock is better than starting with water. Cook your onions and garlic before adding them to the soup pot. Bringing out the sweetness of onions and garlic before adding them to your soup pot will yield a richer flavor. Use herbs with abandon and salt with a generous hand. Okay, I know salt is supposed to be evil and all, but unless you have a health problem that prohibits you from having salt, use it along with an assortment of fresh and dried herbs. Use Kosher or sea salt. Don’t use table salt. Maybe ever. Make your soup a day ahead. If you have the time, make your soup a day ahead and reheat. Soup and stew both benefit greatly from allowing flavors to mingle. This soup is almost more of a vegetable stew, and it bakes in the oven rather than simmering on a stove top. This is perfect for my favorite fall activity–watching football. The entire pot assembled quickly and baked until we were ready at halftime. The house also smelled terrific–all cozy and comforting. The original recipe for this dish was posted to Eating Well, and I changed it up to suit my tastes. I used homemade chicken broth instead of water (see lesson #1 above), but you could make this vegan by using vegetable broth and eliminating the Parmesan cheese rind. I also altered the original recipe, substituting some fresh vegetables I had on hand and adding fresh herbs and garlic. 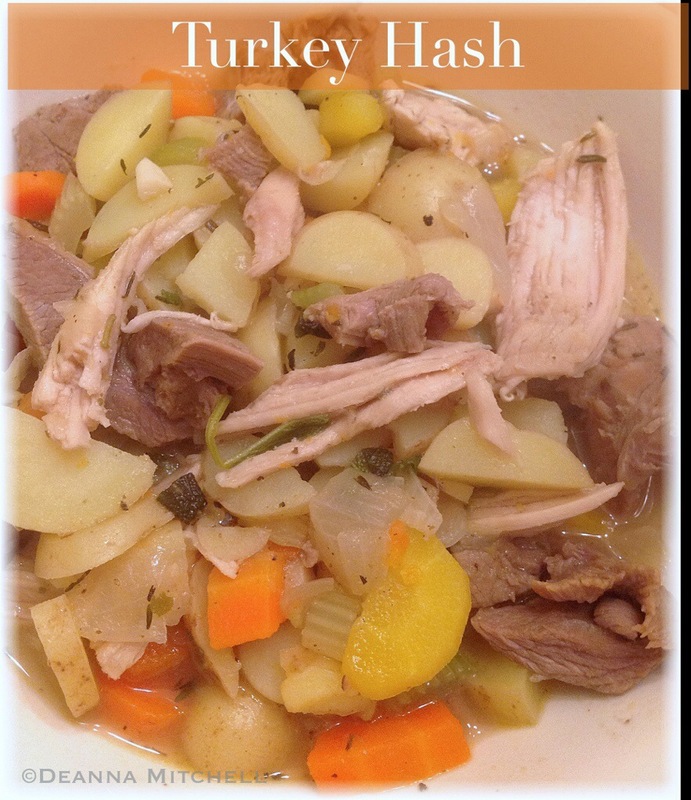 I used my ceramic coated Dutch oven to make this–you will need a very large pot or Dutch oven. 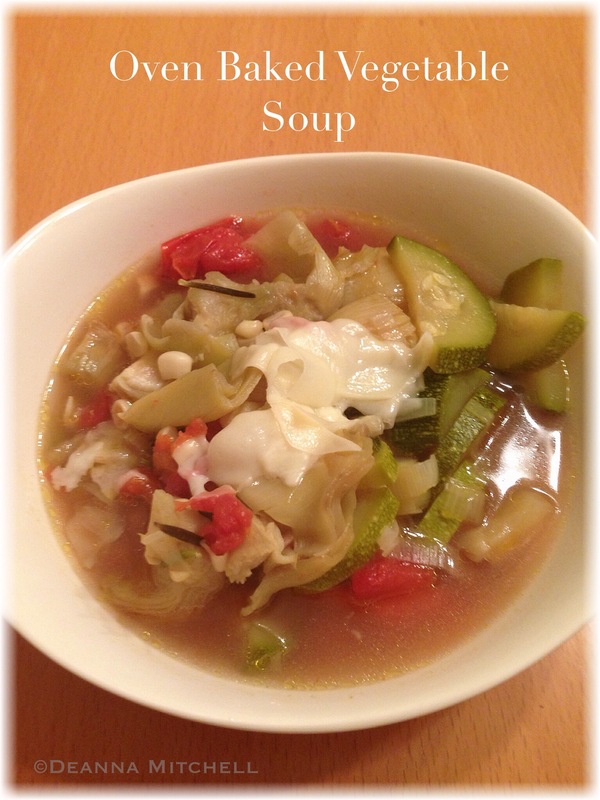 The original recipe says it serves 8, but I think it may serve more–it is a LOT of soup. This recipe comes together quickly and you could really use whatever fresh vegetables you have handy. The next time I make this (and there will be a next time), I may add some cannellini beans for protein. 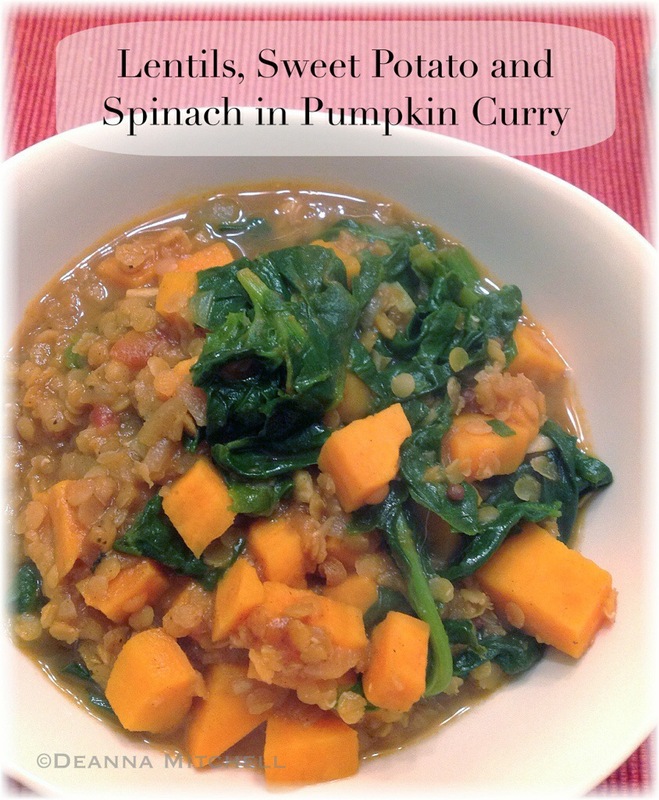 Whatever you choose, this is a wonderful versatile recipe for an easy, lazy weekend meal that is healthy! Pour oil into a large ovenproof pot or Dutch oven. Arrange potatoes in a single layer over the oil. Sprinkle with half the salt and half the pepper. Add the leaves from one sprig of rosemary and 1 tablespoon of the oregano. Layer zucchini, leeks, carrots, mushrooms, corn, artichoke hearts, leaves from one sprig of rosemary, remaining oregano, salt and pepper. Tuck the Parmesan rind into the vegetables. Pour the tomatoes and juice over the vegetables. Add the chicken or vegetable stock. Cover the pot and bake in the oven for 2 or 2 1/2 hours. Serve immediately garnished with cheese and accompanied by a good, crusty bread. This salad wasn’t on my weekly menu, but I made it anyway. Those of you who are Brussels sprout haters will not understand, but I was completely craving these little cabbages. This is one of my favorite winter salads because it is packed full of flavor and served warm, which is comforting on a chilly evening. I am not sure where this recipe originated–I thought I dreamed it up, but it is everwhere, so I’m guessing I am not such a genius! One note: use FRESH sprouts, not frozen. It makes all the difference in the world. We can get Brussels sprouts fresh at our farmers markets during the cooler months, but we also buy them still on the stalk at Trader Joes for about $2.99, making this a very economical as well as nourishing meal. If you can’t find fresh sprouts, you could substitute broccoli, and that would be tasty as well! Toss the Brussels sprouts with the olive oil and spread on a rimmed baking sheet. 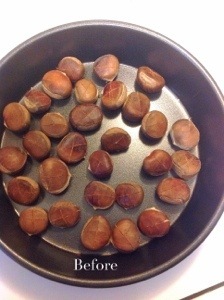 Roast in the oven for about 40 minutes, gently stirring sprouts every 10 minutes. While sprouts are roasting, cook the bacon until crisp. Crumble bacon and set aside on paper towel to drain, reserving 2 tablespoons of bacon fat in the pan. Heat the pan over medium heat and add the sliced onions to the bacon fat and sauté for 20 minutes or so, until onions are caramelized. Add salt and pepper to taste. 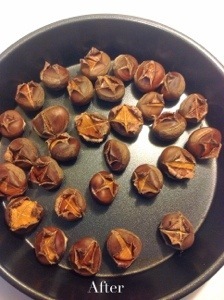 When sprouts are roasted and browned on the edges, remove them from the oven. 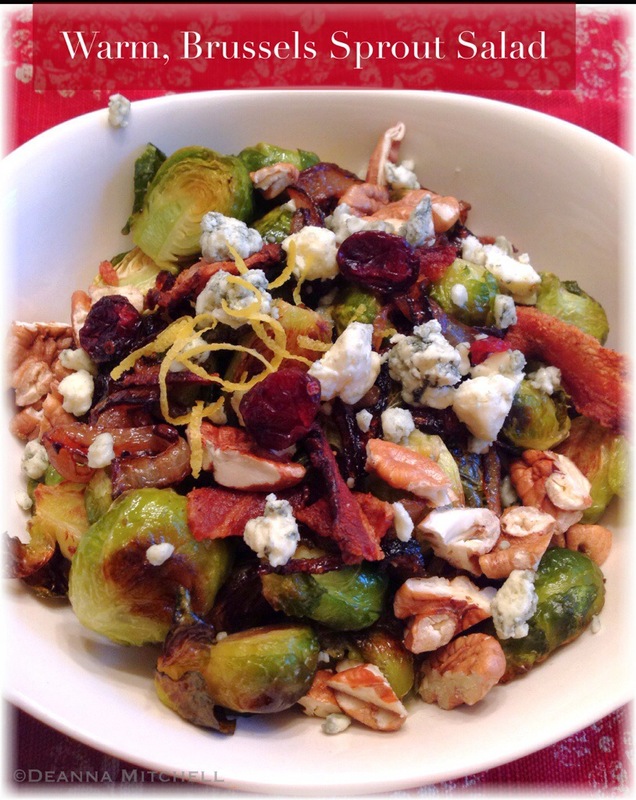 In a large bowl, gently toss the sprouts, onions, blue cheese, cranberries, crumbled bacon and pecans. Divide cooked grains among serving bowls and top with warm salad mix. Drizzle with balsamic vinegar and a squeeze of lemon. Garnish with lemon zest. Serve immediately. Kale is like that popular kid in school who got so much positive attention that other kids starting hating him, just because. You know what I’m talking about, right? Well, kale can be kind of like that–so good and so talked about that people get irritated before they have even tried being friends. Kale is one of those trendy food fads that is sticking with us for the long haul, though. It is just so good and so good for you that it’s hard for me to just roll my eyes at the popular kid and walk away. Kale, I’m saving you a seat at my lunch table. 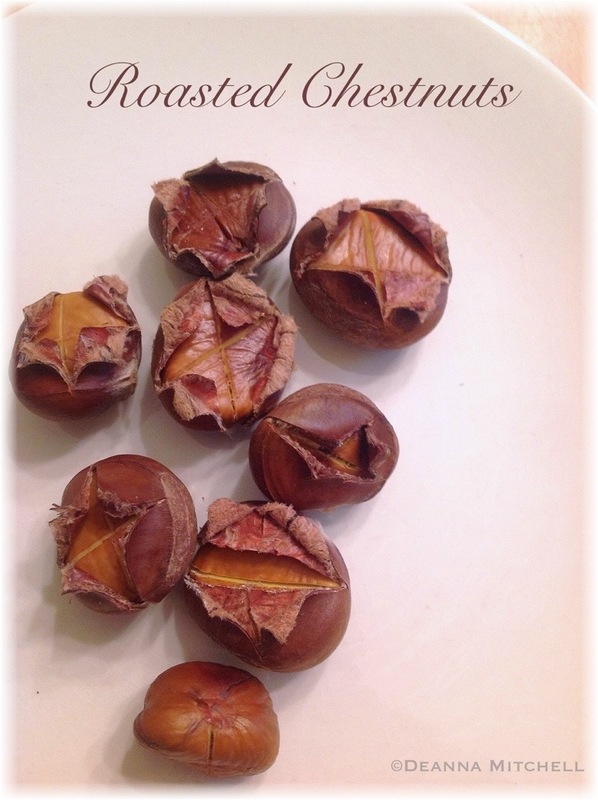 I saw this recipe in Cooking Light and thought it sounded like a terrific recipe to try now, when we are trying to increase our running mileage. 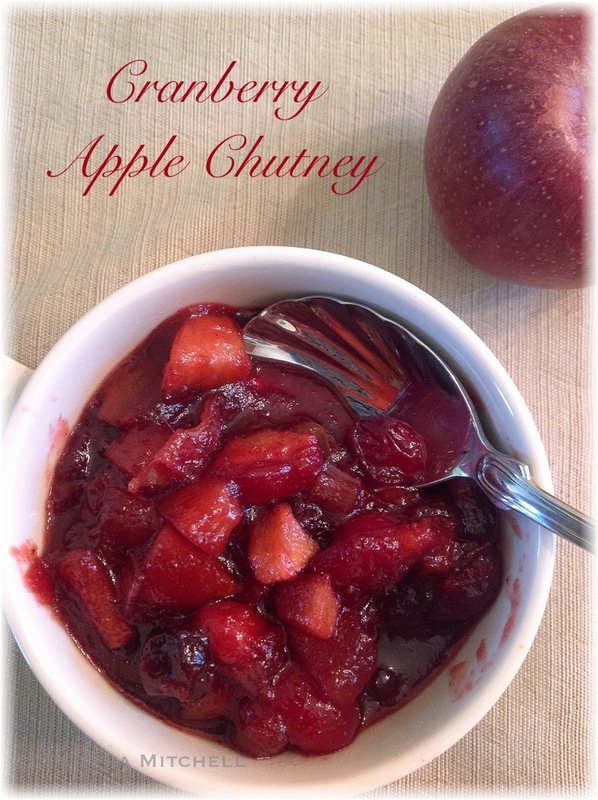 It is hearty, but doesn’t leave you with regret, and it is packed with fall goodness. It’s a perfect dinner the night before a long run, and I’m betting it makes great leftovers (although we ate the whole thing, so I don’t know for sure). It is also a super quick recipe to make–which is good because weeknights are complicated enough. I’ve made some very minor modifications to the original recipe and doubled the amounts to make enough for a family, but this is fairly similar to the original. Put a pot of heavily salted water to boil for the pasta. When pasta water comes to a rolling boil, add the pasta and cook until almost done. Add the kale to the pot, stir well and cook another 3 minutes or until kale is wilted. Drain and reserve 1/2 cup of the pasta water. 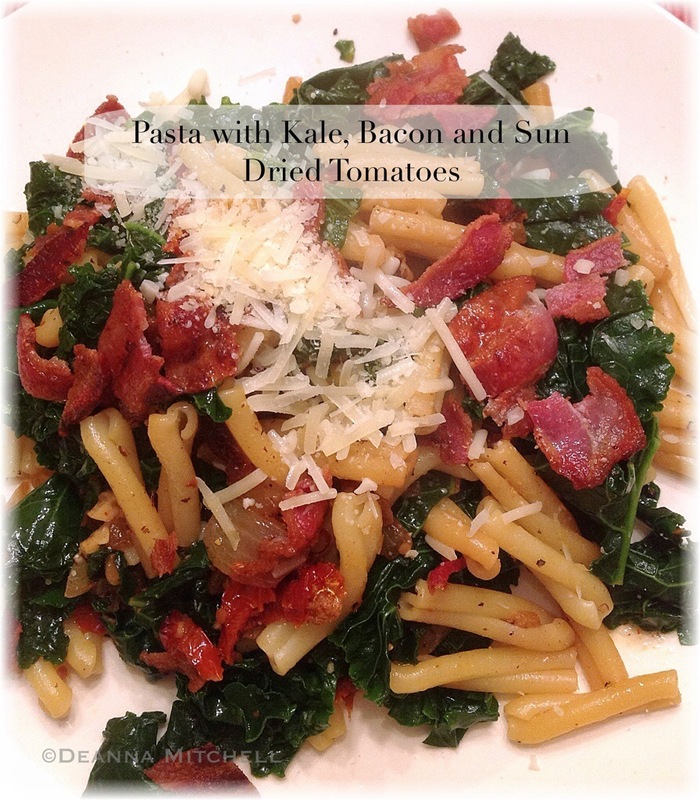 While pasta is cooking, cook the bacon in a skillet over medium heat until it is crisp. Remove bacon to some paper towels to drain. Remove all but 1 tablespoon of bacon grease from the pan and return the pan to medium heat. Add the onions to the pan and sauté for 3-4 minutes. Add the garlic and cook 1 minute. Reduce the heat and add the sun dried tomatoes, salt, pepper, and red pepper. Stir well and heat through. Add the drained pasta/kale mix and the pasta water to the skillet. Heat through and toss all ingredients together. Serve topped with crumbled bacon, cheese and a drizzle of lemon juice.